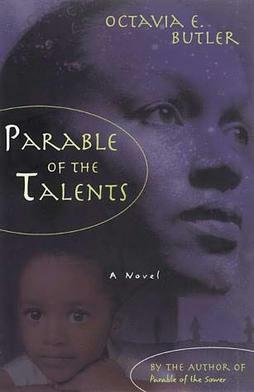 I enjoyed Parable of the Talents for the most part, but I didn't think it was as good as its predecessor, Parable of the Sower. There is a lot to recommend it, and it did win the Nebula award while Sower was merely a nominee, but for whatever reason, perhaps the bar being set so high, it wasn't quite everything I had hoped for. Talents starts out quite slowly. Trudging, plodding through placid communal life in their safe haven of Acorn, I wasn't sure I would be able to finish the book. I was a little tired of the constant threat of danger with very little happening. I'm sure the first 168 pages were setting the stage, and some interesting things do happen, but I had trouble with it. Then, as though it were a roller coaster that just topped the first rise and plunged downward, the book becomes a frantic mess. The memory of the Branch Davidian compound must have been fresh in Butler's mind when she was writing Talents, because there is a lot of similarity in the destruction of Acorn. Instead of being burned alive for their beliefs, however, they are rounded up, collared, and "reeducated" by Crusaders. Olamina's two-month old daughter is taken away from her, and then they spend around 18 months in a concentration-camp-type setting. When a fortunate accident finally frees them, they are in really bad shape. Her dream of Earthseed has been smashed down, and rather than let it happen again, she and her followers separate and try to reestablish themselves and find their family members that have been given up for adoption and worse. So once again, the story slows down. Without the constant threat to survival, it sort of lags. I think that every time the focus shifted to building up the idea of Earthseed, and the religion of "God is change" and "let's go live in space," I got a little bored. I hated watching all these nice people getting sucked into this movement as though it were more than a simple idea being turned into something large and unnecessary. Like the beginning, there are some interesting twists that move the plot along, but the pacing was definitely slower. I was really surprised, then, when the most poignant and devastating thing in the book happened just before the ending, actually in the Epilogue. It wasn't someone dying. There was no blood. Instead, it was the discovery of a betrayal that had taken place years before. It was so simple and basic, but it provoked the strongest emotional response of anything that I read. My final regret is the ending. To me, the technology to become a space-faring people is still hundreds, if not thousands of years in the future (I don't mean little jaunts to the moon here). Yet the dream that Olamina has of seeing people beginning their voyages to the stars is realized during her very lifetime, even though in the first half of her life mankind makes a severe regression in many ways. It's almost like it's tacked on to make the ending more palatable, rather than the dismaying letdown that it seemed to be. Personally, I'd rather see people clean up the earth and become a lot more civilized before they begin taking their habits and corruption across the universe. Even though I've known since I was a kid that eventually we need to leave the earth or be destroyed like the dinosaurs were, I was never crazy about Earthseed, and I derived no joy from seeing it succeed. I always seem to say this, but read Talents if you read the first book, at least so you can find out what happens. There are surprising twists in the lives of the characters that are worth finding out about. However, if you wouldn't like to watch the lives of good people destroyed by the worst things that could possibly happen to them, then maybe this isn't your book. Similarly, if you dislike watching mankind so easily duped into hating one another by their ignorant fears and prejudices, or if you hate religion being portrayed once again in a science fiction novel as a negative development of humanity, skip this one. But if you do like a dark book, or at least one that is primarily bleak and filled with senseless violence, where main characters aren't spared their share of the pain in the world, this could be a good book for you. Not counting, of course, the optimistic ending tacked on in the final pages. How did that optimistic ending relate, if at all, to the moment that so moved you in the epilogue? I tend to think of epilogues being short, so it seems they must be related in some way, but perhaps I am wrong. I liked your description of the first book better. They are both in the Epilogue. I didn't exactly feel like the first part, where the conversation took place, belonged in the Epilogue, but it was. The final section (not counting the actual parable of the talents from the King James) takes place 55 years later. They are together in the Epilogue, but very distantly related, if at all. Jase - Aurelio Voltaire Hernández (aka Voltaire, who Jen and I went to see last year in concert) has a very gothy sounding name, which totally compliments his music, but came by it naturally. Which presents the point - do our names make us who we are? Are we destined to become that which our names label us to be? Oh man, I'm loopy tonight. I need to sleep. So that makes me... a Greek Sailor who marries a witch and looks for the golden fleece, while maintaining a business selling cowboy cut pants and another selling cheap household appliances? I knew what you meant, I just take every opportunity to self-deprecate that I can. I'm not sure my mind ever comes out the fog. Interesting point about the name, though I believe pseudonyms are more common than not in fiction novels. I know if I wrote a novel they probably would refuse to publish it unless I had an alias. Probably a different look and personality, too. No book signings for me, I'd drive away my few fans. Alright, Jase, do me! Amanda Gignac - what does that make me grow into? Probably something neurotic, that no one understands (hence the no one can pronounce that last name), right? Maybe you could go for the mysterious, strange, and ugly thing. You know, like the Phantom of the Opera. But you still have to tell me what my name means I'll become. Um... Neil Diamond's girlfriend, who happens to like cognac martinis straight up? "If you do like a dark book, or at least one that is primarily bleak and filled with senseless violence, where main characters aren't spared their share of the pain in the world, this could be a good book for you"
YYEEESSSS!!!! This sounds like my cup of tea. Yeah, so between the kilts and the attraction to senseless violence... do you guys have a lot of late night noise ordnance violations at your house? There are benefits to having a defense attorney in the family. I'm trying to think of some clever repartee here that I won't regret in the morning, and failing. Hey, this page needs some love, too. And no fair, Mandy deleted one of her posts, it should show one more! Wah. Well, I checked, Octavia IS in fact her real name. And she's dead. Two years ago. Oh, I only deleted it because it sounded funner with Jason's two comments together, sorry 'bout that. Yeah, Mandy, bring it on! I'm too slow with the posts, due to this laptop I'm borrowing. I hate not having a mouse. You're right, the orange B is what has been missing from my life. Goodnight all, even to my archnemesis Byron. It must stand for Blogspot, right? I mean, I can't think of another important, terrifying, hidden meaning. Some other B word, yet so difficult to fathom. Subtlety, thy name is _yron. My followers have a B next to their names, and my enemy, something that looks like a shooting gallery target. I AM a Sprite commercial.